This dish is incredibly easy to make, healthy and so so delicious! I buy my ahi tuna from Boyd’s Lobster Shop, where you can always buy it frozen but if you go on a Saturday you can get it fresh. If you don’t have a ring mold to make the “stack” then just toss all ingredients in a bowl instead and dig in! In a medium sized bowl, whisk together the orange juice, ginger, rice wine vinegar, honey, sesame oil and fish sauce. In a separate bowl, toss the ahi tuna and the nori with approximately 2 tablespoons of dressing. In another bowl, combine the mango, cucumber and green onion. To make the stack, place a 3.5-inch circular ring mold in the middle of a plate. Fill it with the cucumber mango mixture, pressing down firmly on the top to create a more stable base. Layer with the tuna, pressing down firmly again. Remove the ring mold slowly, to reveal the tuna stack. 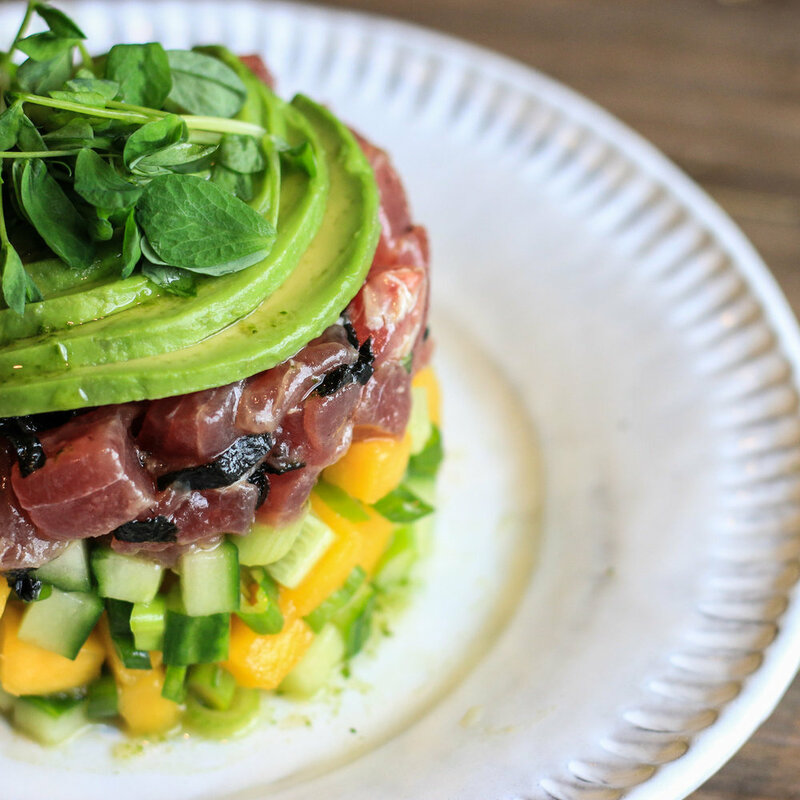 Gently top the stack with sliced avocado and pea shoots and drizzle with remaining dressing. Serve this as is, with rice or with wonton crisps.